Tell me if you have heard this before: “We need more and/or better leads.” The chances are, if you’re in high-tech marketing, you probably hear it on a daily, weekly and monthly basis. Why? According to Forrester consultant Tom Grant, it’s because of the need to feed the funnel. In his report, Tech Marketers Pursue Antiquated Marketing Strategies, Grant writes, “B-to-B technology companies treat marketing as an opportunity to sell new products and services to new customers.” As he stated, “The product is the axis around which marketing efforts turn,” and as a result, the primary objective of marketing is to produce leads. Similarly, marketers have long held the belief that because sales have a short-term focus on making quarterly objectives, marketing either lacks the appreciation of, and/or the sophistication to understand anything other than lead generation, for example, longer-term brand building and awareness activities. But what if both of these viewpoints were actually wrong? What would happen if you asked sales what they valued rather than assumed you knew the answer? How might it change how marketing thinks about its impact on the organization? For one B-to-B tech company, feedback from the sales force is helping marketing refine its value to the organization. “When it comes to enabling the sales force, we’ve previously relied on what I call ‘measurement by anecdote.’ Our goal with this study was to quantify what sales values from marketing so we can focus on the things that make a difference,” said Rick Dodd, SVP marketing of Ciena, a $2 billion global optical and packet networking company. To gain that insight, the company surveyed its global sales force, including five types of sales reps covering five different account types. Over 400 sales reps provided feedback on their priorities for marketing and marketing’s performance. 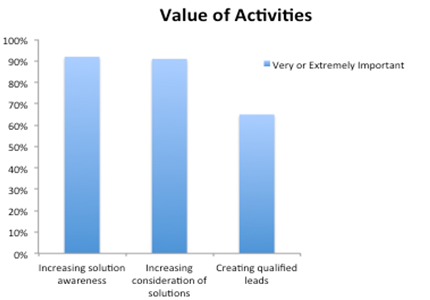 According to sales, the highest- ranked marketing activities were at the top of the funnel; 92 percent of sales said that increasing the awareness of solutions was very or extremely important, increasing consideration was close behind at 91 percent, and only 65 percent mentioned lead generation. “Our sales force is very experienced; they understand that technology and industries change quickly. We’ve obviously been successful positioning ourselves for today’s market, and now we want to take best advantage of the big shifts in our landscape. The survey showed us that for sales to be successful, marketing has to be able to change customers’ and prospects’ perceptions,” according to Dodd. And Ciena is not alone in that challenge. The Aberdeen Group’s recent Demand Generation study found that 77 percent of respondents rated visibility into lead performance across stages as very valuable, but only 43 percent indicated they could do this effectively. Instead of spending a lot of time and energy in trying to perfect an imperfect process, the company is focusing efforts on measuring marketing performance at the macro level. “At the end of the day, our performance is ultimately measured in sales success, so that’s what we are focusing on measuring,” said Rozier. To do that, the company has created a quarterly dashboard from the survey. Two regional sales organizations each quarter are asked to evaluate marketing’s performance in three areas: (1) contribution to sales success; (2) performance compared to competitors; and (3) contribution to the success of the organization. Ciena’s approach, as Dodd concludes, is to put the focus on the right conversation. “As we learned through the research, contributing to the success of the sales force isn’t just about one thing. It isn’t just lead gen. I appreciate that they give us credit for doing a good job when compared to competitors, but what we’re most interested in understanding is how well are we doing in enabling them to win. If the sales team rates our contributions as being valuable to their personal success, then we know we’re doing the right things,” according to Dodd. Scott Gillum has been the CMO of an INC 500 firm and the interim CMO at a Fortune 500 company. Currently, he leads the Channel Marketing practice and the Washington, D.C. office ofgyro, a Top 50 global advertising agency. Prior to joining gyro, he spent a dozen years with MarketBridge, providing sales and marketing consulting services to Fortune 500 companies.